You all know that I really love dresses. I picked some of my favorites from the Dutch social shoppingsite Fashionchick. It's like a search engine that searches a lot of online shops at the same time, so it's super easy to find what you're looking for. Jullie weten allemaal dat ik dol ben op jurken. Ik heb wat favorieten uitgekozen bij Fashionchick. Daar vind je een groot overzicht veel leuke online shops, waar je in één oogopslag het aanbod van al deze shops kunt zien en doorzoeken. Zo vind je gemakkelijk de leukste jurken, van zomerjurken tot avondjurken. Wow, each dress is prettier than the last. Lovely collection! Ohhh thank you for the website recommendation, I shall check it out right now! @Amy: Yeah, sorry! It's in Dutch and for now there's only Dutch, French and German versions. No English one yet! mm!! gotta love number 1 and 3! beautiful. Ik kan niet kiezen, vind ze allemaal zo mooi en leuk! 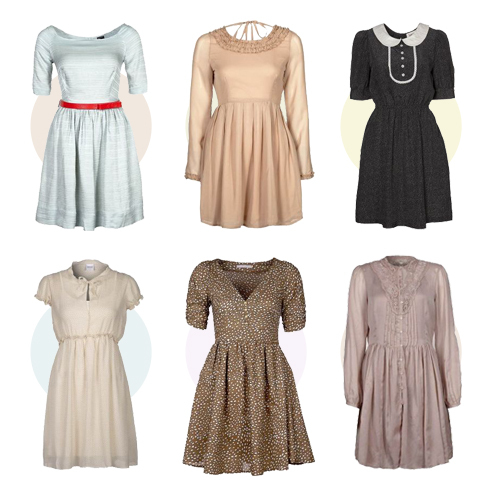 they are all cute but I especially love the black one with the peter pan collar. adorable.